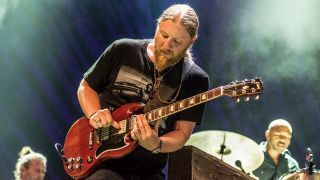 Slide maestro Derek Trucks reflects on the menace of unreliable tour buses and how he’s always on the hunt for good bourbon. What was your first ever gig and how did it go? “It was at this local blues club up in Jacksonville; I was nine years old and I got up with an acoustic guitar. I think it went well - I was probably terrified! But the first time I played with a live band was at the same place with this blues band called Ace Moreland. “It’s pretty simple. There’s an amp maker in New Jersey, his name is George Alessandro and he kinda built this amp for me because I love the sound of the Super Reverb and it’s kind of beefed up - somewhere in between a Dumble and a Super, so there’s a little more juice, a little cleaner. “It’s just four 10s, a head and a few guitar cables [laughs]. I have this delay pedal that I sometimes loop into it - an Echoplex pedal - just to toy around with, but I don’t use it very often. Maybe for a moment every two or three shows, but I unplug it if I’m not using it. I unplug the guitar if I go into a tuner, too; I like keeping it as clean as possible. What’s your best tip for getting a good live sound? “I really think it comes down to not getting too far down the wormhole with monitors. If you’re cranking your monitors, it affects everyone around you and then they’re adjusting. I think the closest you can get to hearing the instruments together with each other the better. “I think the audience can feel when you’re inspired and you’re having a moment. We’re not a group that outwardly looks for crowd reaction. We’re not egging them on too much, but there are nights when it’s really working, there’s a great synergy with the audience and the music on stage - and they feed each other. But if you hit the stage relaxed and you let it unfold, you’re having these musical moments, I think that people feel that. What’s the best venue you’ve played in and why? “Man, there are quite a few… We play the Beacon Theatre in New York City a lot. I probably did 175 shows or more there with The Allman Brothers and we’ve done 21 sold-out shows there and that place just feels good. There’s something about knowing all the crew, everybody that works there, the audience - if you know most of the people in the audience, it’s comfortable - and it’s a great-sounding place. I was never at the Fillmore East, but everyone who was in the Allman Brothers camp felt that The Beacon was the natural heir to that venue in New York. So that place is pretty special. What’s the worst journey you’ve had either to or from a gig? “We’ve had some good ones, especially in the days when we were driving a 15-passenger van with a trailer. So many mechanical issues. I remember one time we were driving between gigs and we ended up in this place called Dumas, Texas with a busted axle in the trailer and there was just nothing for miles and miles, and the only place that was open on was this old farmer who fixed things. What’s the nearest you’ve come to a Spinal Tap moment? “We had the van break down in North Carolina and we had a gig that night in a place called Pleasant Gardens, North Carolina, some kinda festival. So we get the van fixed at the last minute and we’re calling the promoter. “We ended up making the gig, but the festival was so terrible, I guess the cops had come in and busted everyone and all the rednecks in the middle of nowhere were just losing their minds. It was not a good scene. We pulled in, pulled up to the makeshift stage and some of the crowd were messing with the van, asking us if we had beer. 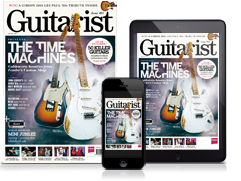 As a musician, which airline do you find it easiest to travel on?